After visiting Ross, we continued our roadtrip in Tasmania and arrived around 4 pm at Launceston, another beautiful city in Tasmania. 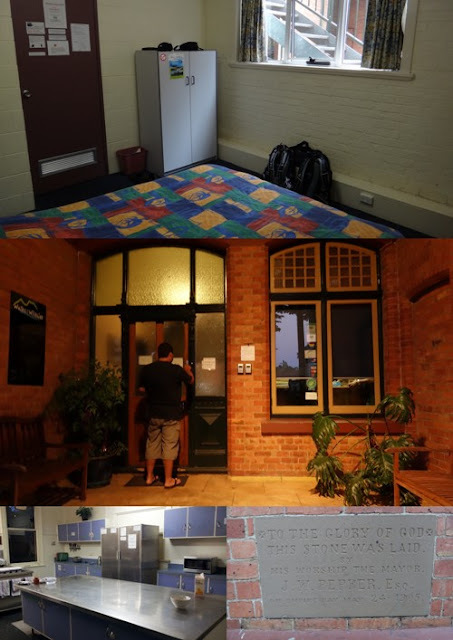 We went directly to our hostel which is called Launceston Backpackers Hotel. We choose this hostel due to its reasonable price (double room with a shared bathroom cost us AUD 53) and also because it has a free parking which we needed for our rented car. The hostel replied promptly to our emails prior to our departure. Actually we were planning to come late on the Christmas eve, and they have arranged how we could do our self check in. We left Hobart at 11 am, and followed a car of our friend Zaratul Khairi and his family, as he got a GPS inside his car. 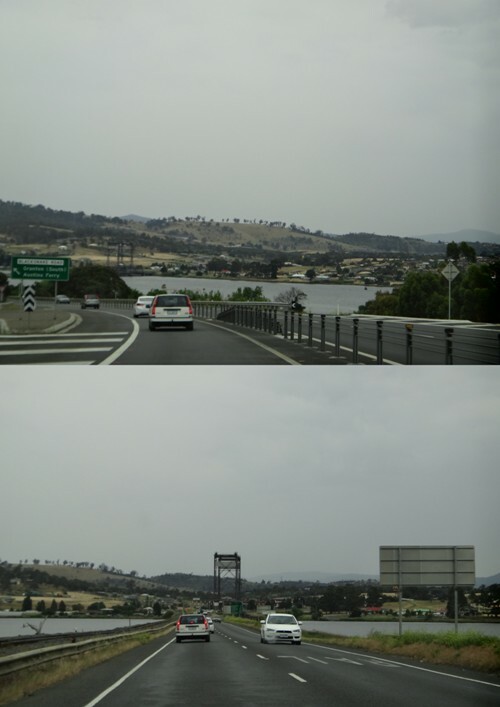 We took the highway heading to Launceston and enjoyed beautiful sights along the way. On our second day in Australia, we took a morning flight from Melbourne Tullamarine airport to Hobart, the capital city of Tasmania. 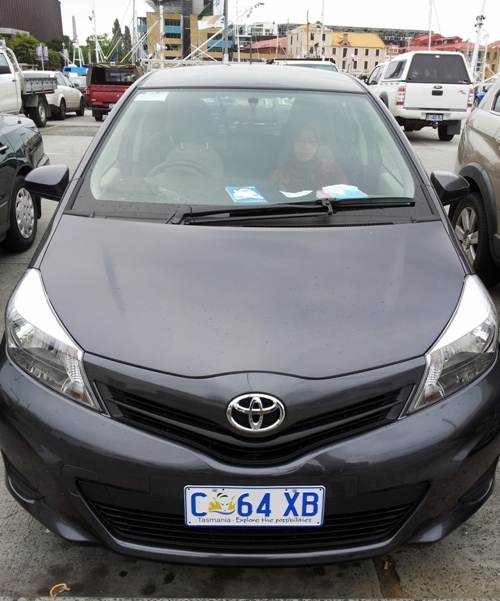 We couldn’t manage to extend our car hire, so we were looking for the alternatives on how to transfer from Hobart airport to the Hobart city. Upon arrival, we saw this City Hotels Shuttle. We asked the driver, and he said that the seats were still available. It cost us AUD 17 per person, expensive, but we didn’t have any other choice that time. But the driver was really nice, he act as our tour guide on the way explaining the interesting places to visit in Hobart. 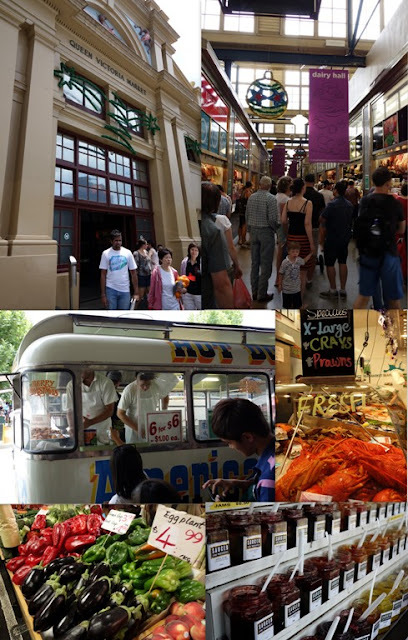 Arriving at Queen Victoria Market, we passed the meat and seafood section, the dairy section, and to the colorful section of fruits and vegetables. Of course we also buy the traditional doughnuts cost AUD 1 per piece. Aaah how we love this market! 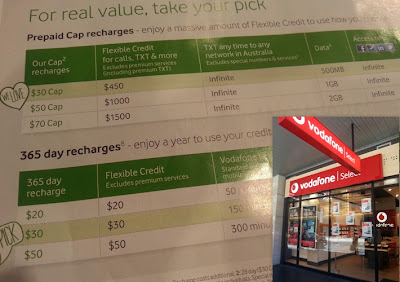 Upon arrival at Flinders Station, we went directly to Vodafone outlets located just opposite the station. We asked the guy what are the alternatives for prepaid simcards for phone and internet data plan. The guy showed us a list of alternatives (you may see it in the below picture). We choose the first row => package of AUD 30 + AUD 2 (cost of the card), which includes phone calls up to AUD 450, free sms, 500 MB data and unlimited social media. Vodafone also provide micro sim card for internet in Australia (that would be for my Samsung S3), but I told rene that we wouldn’t need two simcards. Based on our experience, we are satisfied with the performance of our vodafone. Of course there are some other telco operators, we bought vodafone as its outlet was the closest to the train station when we first arrived in Melbourne. You may compare the above table with rates offered by other telco companies, and find the one that best suit your need. It was our first time ever visiting Australia, we took Garuda Indonesia which flies directly from Jakarta to Melbourne. We arrived just 3 days before Christmas, the airport was not that busy when we arrived at around 9 am. The immigration process was fast, and the officer were really friendly. The only complaint upon arrival in Melbourne Tullamarine Airport was that we had to wait for 30 minutes to get our luggage. I don’t know whether it’s normal or because it’s holiday time? Anyway, we could get out of the airport directly after taking our luggage. There weren’t any inspection as I thought it would be. 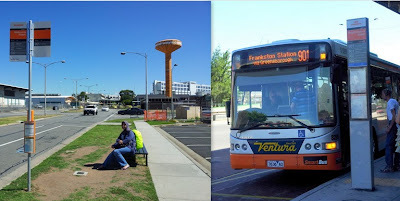 Having read the Tripadvisor review regarding the cheapest public transport from Melbourne Tullamarine airport to the city, we wanted to give it a try. We had plenty of time that day and of course we’d like to save our budget. 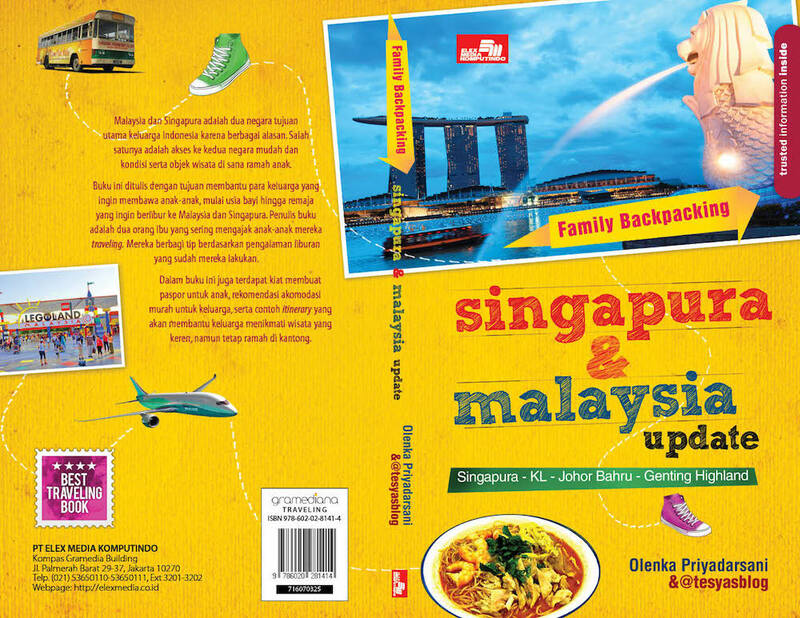 From the review that I read, it cost only AUD 6,20 per person (compare that with a one way ticket of Skybus AUD 17!). I also read that there were no sign at the airport to the public bus stop. It seems that the airport recommend visitors to take the express Skybus which can take you to the city within 20 minutes (excluding the waiting time). When we exit the international airport, we followed the direction to T4 (Tiger Air Terminal), because it is the closest terminal to the public bus stop. At T4, we were confused where to go, as there was no public bus stop around T4. We asked a guy, who showed us that we should take Skybus. No thanks. Then we asked a lady, who didn’t really know where the bus stop located, but when I told her that it is should be in front of Toll Dnata building, she said that we have to walk a little bit further from T4, and cross the road. And yes we could see a bus stop, with its sign on the grass. Lucky us the bus was waiting for the passengers when we walked to the bus stop. Stayed there more than a year ago and I haven't posted my review on Graha Cakra Malang. 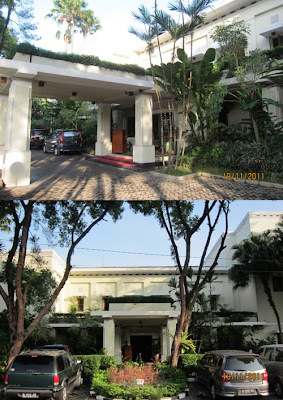 They say it's better late than never, so I would like to post my review on one of the old style hotel in Malang. This is the front look of the hotel. We always go to Bandung early in the morning to avoid traffic jam from Jakarta to Bandung on the weekends. We usually arrive in Bandung at about 8 am, and the Three House Cafe is one of our fave stop to have breakfast in Bandung. The cafe is really child friendly, having its own three house, where our kiddos love to play (and coming early in the morning means the three house is only for our kiddos:p). Karena kami berencana melakukan self drive di Tasmania, maka kami pun mencari informasi apakah SIM Indonesia dapat diakui di Australia. Sebetulnya jika ada cukup waktu (dan tentunya cukup cuti), kami bisa saja mengurus SIM Internasional di Korlantas Polri. Namun karena letak kantor kami yang dipinggir Jakarta, maka kami mencoba cara lain. Karena rene yang akan mengemudikan kendaraan yang kami sewa selama kami di Tasmania, maka untuk urusan SIM ini saya serahkan ke rene. Rene mendapatkan info bahwa SIM Indonesia bisa dipakai dengan dilengkapi terjemahan dari Kedubes Indonesia di Australia. 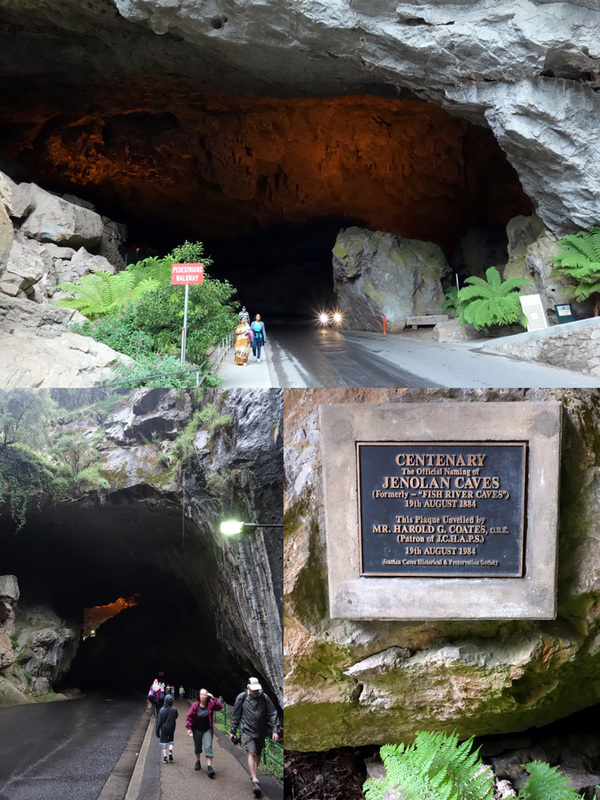 Tapi karena 12 hari itinerary di Australia kami yang super padat, rasanya tidak mungkin kami meluangkan waktu ke Kedubes hanya untuk minta terjemahan. - menggunakan SIM Indonesia disertai dengan terjemahan yang sudah dilegalisir kedutaan atau pihak yang memiliki serifikasi NAATI atau AUSIT. 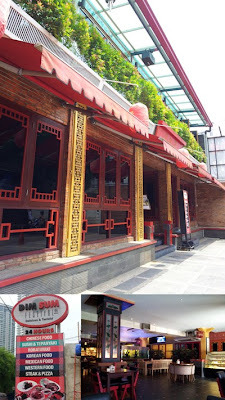 Whereever you go in Malang, you will find Guesthouse in every street! 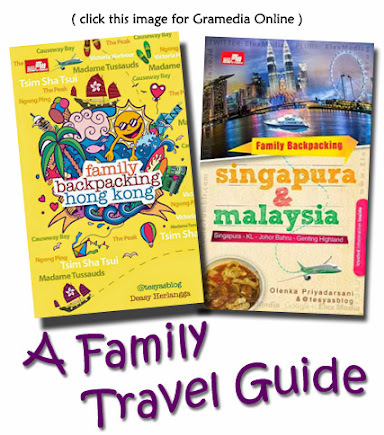 So how to choose one of the best among so many guesthouses? 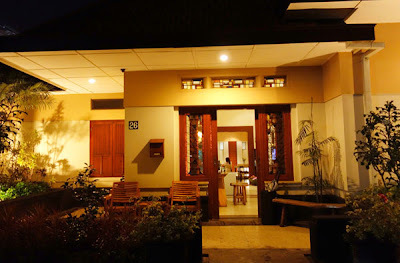 I checked on tripadvisor.com for their reliable review as always, and I found out that this Merbabu Guest House Malang is the number 1 guesthouse in Malang. I sent email to book a room in the guesthouse, and they replied promptly. I booked one deluxe room including bfast for IDR 360,000. 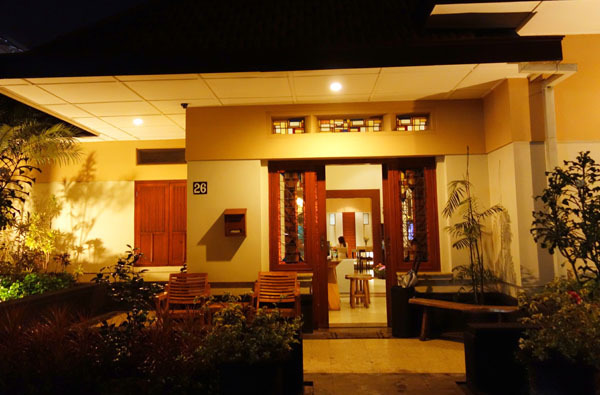 This is the front look of the Merbabu Guesthouse Malang, it's really homey. The guesthouse is located on a road with many cafes and restaurant in a walking distance. We rented a Honda Vario from the front desk 24 hour for IDR 80,000. The motorcycle doesn't belong to the hotel, the staff called a motorcycle rental for us, and later on the hotel kept our ID (KTP) at their premises until we returned the Vario. Whenever I have a chance to visit Malang, I always try to find my fave food in Malang which is Bakso Bakar (grilled meatballs). 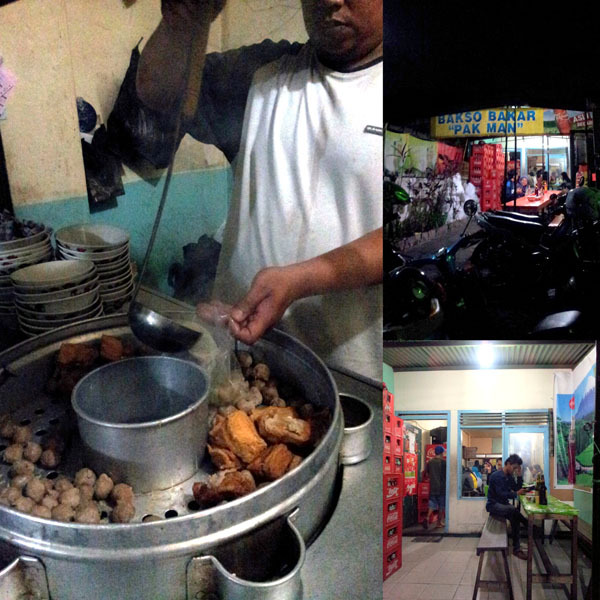 Usually I go to Bakso Bakar Trowulan, but as it rains a lot during our weekend getaway in Malang (Nov 2012), we went to Bakso Bakar Pak Man on Jl. Diponegoro Malang. Sesungguhnya salah satu hal yang saya suka dari planning suatu liburan adalah membuat itinerary, karena kegiatan ini banyak menambah wawasan dan pengetahuan saya tentang tempat yang akan kami tuju. Saya juga senang membantu teman membuat itinerary, karena dengan begitu saya selalu update dengan tujuan wisata. If you are looking for a hotel with a swimming pool for kiddos in the heart of Singapore with a limited budget, I would recommend the Fragrance Hotel Riverside at Clarke Quay. 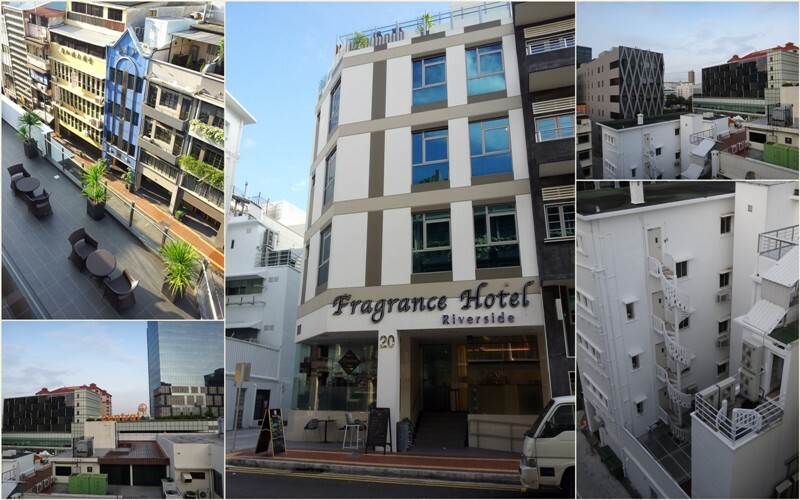 It's strategically located, brand new and very clean, the seven eleven is next door, and it has a rooftop pool! Read the rest of the post and I will tell you why I like this hotel a lot. Jadi anda sudah membaca posting kami tentang mencari ticket pesawat ke Australia kan? 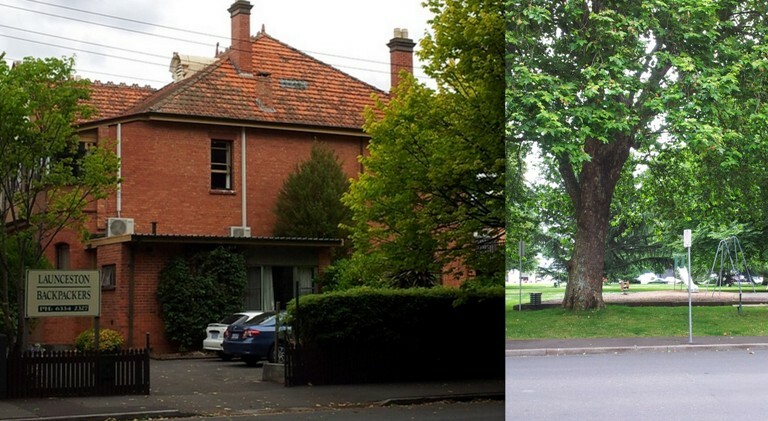 Nah ayo kita teruskan cerita mencari ticket dari Melbourne. 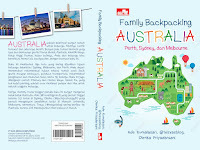 Karena tujuan kami ke Australia memang untuk menikmati pesta kembang api Sydney pada New Years Eve 2012, segera setelah membeli ticket Jakarta-Melbourne, kami mencari ticket lanjutan Melbourne-Sydney (hunting kami lakukan bulan Juni 2012). Dan kala itu kami langsung riang gembira karena ticket Jetstar sedang promo. Ticket pada tgl yang kami inginkan yaitu 28 Desember 2012 harganya AUD 39 one way! Tapi anda harus menambahkan budget untuk Sita Bus dari Melbourne ke Avalon airport dengan harga AUD 20 one way per person. Mahalnya!